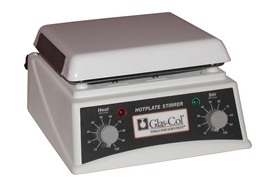 Glas-Col hotplates, stirrers and hotplate-stirrers feature an exceptionally durable, chemical resistant white ceramic work surface. Their space-efficient design (8” x 9” footprint), makes them ideal for use on crowded bench tops and inside of bio-hoods. Advanced microprocessor controls with convenient turn knobs allow quick, precise adjustment and maintenance of speed and temperature. Safety indicator LED’s on the front panel indicate when the heating and/or stirring functions have been activated. 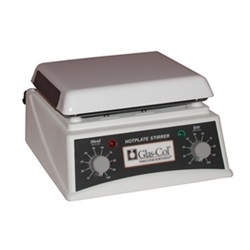 With a square 7.5” work surface, all three models are compatible with a wide variety of popular sizes of borosilicate glass beakers, flasks, bottles and other vessels. 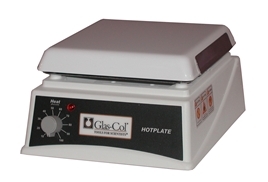 The hotplate/magnetic stirrer model comes complete with a support rod for mounting thermometers and temperature probes. 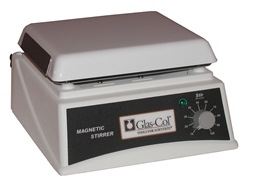 Magnetic stirrer, 7.5" x 7.5"
Hotplate Stirrer, 7.5" x 7.5"